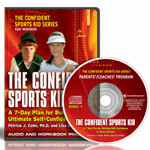 You are here: Home / Kids in Sports / goals for kids in sports / Is Setting Goals Too Much Pressure for Young Athletes? Do you feel frustrated when your young athletes seem to lack motivation and direction? Would helping sports kids set goals be helpful? Trying to motivate without pressuring. well-meaning your intentions are. It’s also likely that you feel frustrated and confused. At what point is setting goals simply another way to pressure young athletes? We’re here to tell you that helping kids set goals is NOT pressuring them—but it’s critical for you to follow our tried-and-true guidelines. We just completed a new Kids’ Sports Psychology e-book, “Drive For Success: How Young Athletes Can Achieve Their Goals” written specifically for kids. In order to reach for their dreams, kids do indeed need to set goals. The process can improve their motivation, focus and dedication to their sport. Goals help athletes identify their weaknesses and structure practices so they’re as helpful as possible. Your young athletes should set their own goals. You certainly can help them set their goals, but they should be their own goals, not yours. When kids set their own goals, they are more likely to take ownership in them and stick to them. Setting goals, however, is tricky. Kids need both short and long-term goals. They have to be very careful about how they try to achieve them. And you have to be careful as sports parents and coaches about how you try to help them achieve their goals. Yes, goals can become pressure—too much pressure. Our newest e-book, “Drive For Success: How Young Athletes Can Achieve Their Goals” tells sports kids the secrets to setting goals in ways that improve their success and help them feel more confident in sports.